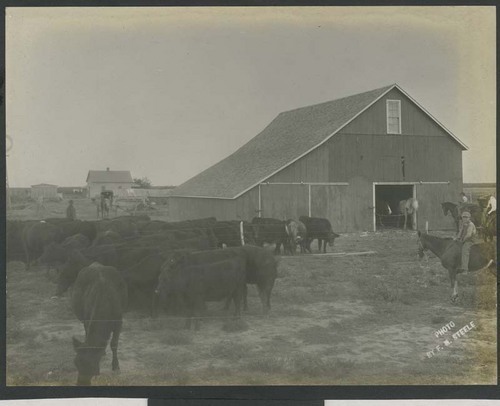 This is a view of cattle in a fenced pasture, next to a barn, on an unidentified farm presumed to be in Haskell County, Kansas. Also visible in the photograph are a man afoot, a horse-drawn carriage, a farmhouse and outlying farm buildings, and a man and boys astride horses. Kansas History (Article) -- Jim and Cathy Hoy, "Portraits of the Plains: The Photographs of F. M. Steele." 28 (Winter 2005/2006): 262-273.